on “the Ark of the Covenant” FREE together with appropriate Knight’s Templar Regalia certificates etc...Relating to their Membership Rank. Knights Chevalier can learn up to the highest level of knowledge - 33 degrees. You must tick at least one Option to qualify. 2. You have, by tradition, 37 days to "Take up the Mantle". In bygone days a Knight would have to obtain his “mantle, armour and steed”. (Today you just need to buy your regalia) Everyone, including the Grand Master, bought their own Regalia. You have one chance to join; there is a Knights Templar saying “there is no second chance in battle”. 3. 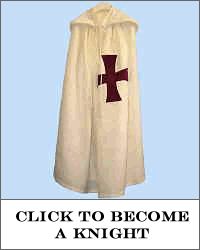 Support your new fraternity of Brotherhood of the Knights Templar Order any way you can. 4. As a Knight "Your Word is Your Bond" you are expected to behave honourably with a Knightly conduct towards your fellow Brothers and Sisters of the Order. 5. As a Knight you are expected to be charitable to your fellow humans, and help the needy when and where ever you can. Knights Templar ensures that all money raised for charity go to charity. 6. As a Knights Templar you address all your fellow members as “Brother or Sister” as the code promotes brotherly and sisterly love towards each other. 7. A Knights Templar is honest with integrity and lives by a code of chivalrous behaviour. 8. Taking up the Mantle of a Knights Chevalier (becoming a Knight) is the highest commitment one can make to pledge a life of doing good. 9. We welcome your intention to be a Knight of the Knights Templar. We hope that our code of Honour is your code of Honour and that you will join our Order of Honourable Men and Women worldwide. You are being born again a “Knight Chevalier” with HONOUR as your new code of life. You are here for a reason, destiny brought you here. We believe in the saying "Once a Templar always a Templar, you may have been a Templarin a previous life which is why you are drawn to the truth. 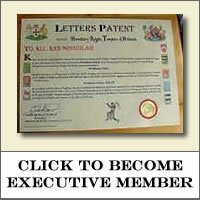 Executive Member can learn up to 10 degrees of knowledge. (1st degree is free). Receive Executive Regalia and can introduce members. Promotion to Knight through achievements. No achievements are required, it is up to the member to choose or not. You can do a lot, or a little or nothing, no pressure will be put on you, everyone acts on a voluntary basis. Official Member can learn up to 5 Degrees of knowledge. Receive Official member Regalia. Promotion to Executive Member and then Knight through achievements. No achievements are required, it is up to the member to choose or not. You can do a lot, or a little or nothing, no pressure will be put on you, everyone acts on a voluntary basis. Many Organisations claim to be Knights Templars but they fail to have any links to the original 12th-13th century Knights Templar Order. A Former-Vatican Priest carried out an investigation lasting 7 years into the various Knights Templar Organisations throughout the world, to ascertain which ones had links with the original Knights Templars and which did not. Our Grand Master met up with the Former Vatican Priest that had carried out the investigation, and he confirmed that we, the Hereditary Knights Templar of Britannia, are linked directly to the Original Knights Templars in England and that our Grand Master was by hereditary birthright the ancestral true Grand Master of the Knights Templars of Britannia.